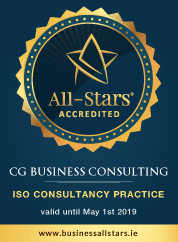 CG Business Consulting have been accredited with All Star ISO Consultancy Practice 2018, we are absolutely thrilled! We received the award from Kieran F. Ring of the Global Institute of Logistics Global Institute of Logistics who is the Deputy Chairperson, Business All-Stars. 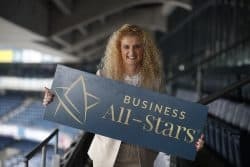 The Business All-Star program is an annual competition designed to identify and recognise Irish companies and individuals that have distinguished themselves in the conduct of their business over the last 12 months. Caroline set up CG Business Consulting back in 2009, when she saw an opening for a hands on consultancy helping companies in developing and delivering ISO management systems across a wide range of industry sectors. We provide simple and effective management system consultancy services to organisations wishing to achieve certification to ISO standards. Divided into 21 categories, ranging from All-Stars New Business to All-Star Innovative Business, the line-up reflects the diverse stages of development and vertical specialisation of Irish companies. 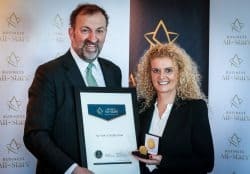 Winners in each category are designated with All-Star status and as such represent the highest current performance level in Irish business, and are presented as a standard or benchmark to be equalled or exceeded. The 2018 All-Star Judging panel was Chaired by Dr. Briga Hynes of the Kemmy Business School, University of Limerick and assisted by Deputy Chair Kieran F. Ring of the Global Institute of Logistics.